Please update your RSS feed reader, and I’ll see you on the flip side! 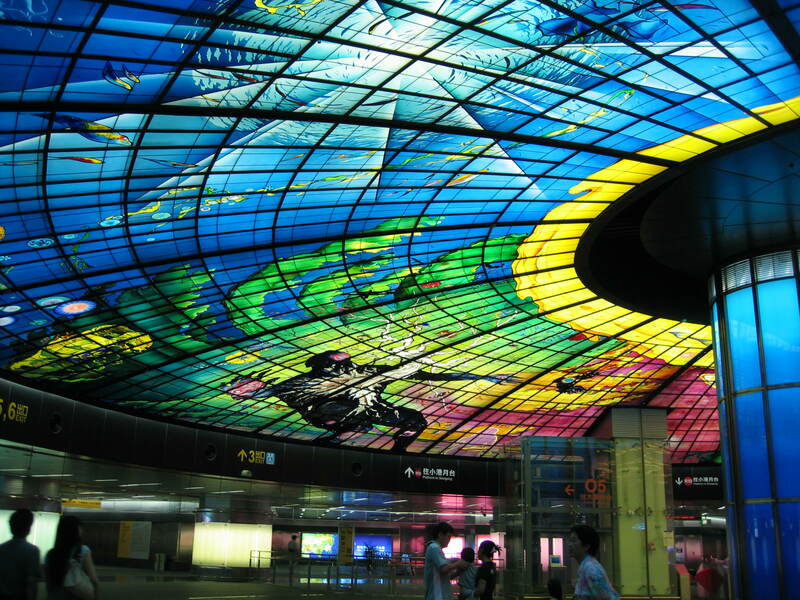 If you’ve ever smiled at the little brass men in the 14th St subway station or admired the colorful tilework at City Hall station in New York City, I think you’ll agree that this subway ceiling taken inside a Taiwan station blows all that out of the water. Standing underneath it, I really felt like I was looking up from beneath the ocean surface. Beautiful. The rest of the subway was impressively clean and pleasant as well, despite the crowds. dense data visualizations data presentations that appeal to senses besides vision – smellovision??? Most of the conjectures for the future were inspired by things we’d read about or seen as emerging technologies that could one day be developed into commercially viable products. It seems extraordinarily difficult to come up with visions of the future that don’t stem from something familiar and present. What do you see coming down the pipe in the next 20-50 years? Here is a version of a Toy Story 2 trailer video cut to the audio track from a Dark Knight trailer. Although both the video and audio sources were probably used without permission, the resulting recut on YouTube is entertaining in its own right because of the juxtapositions the creator chose to make. Watching it reminded me of the ongoing debates surrounding copyright and fair use which Professor Henry Jenkins explores on his blog. Disney in particular gets a mention for its extremely aggressive copyright control practices. There are those who watch the game and those who play the game. Which are you? Just kidding, we’re all playing this one. Place your bets now! 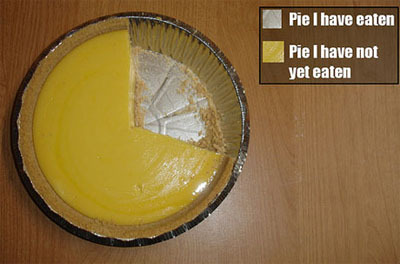 This pie chart made me laugh and reminded me that it’s nearly October. Pie season is almost upon us. There is an interesting article in The Atlantic about how the Internet may be shaping our thought patterns. The author makes the generalization (based on anecdotal evidence) that people tend to skim rather than read online, and that our ability to read with deep, sustained engagement becomes impaired as a result. He claims he cannot even read a long article anymore without getting distracted. Maybe I’m just old-fashioned, but it sounds to me like the author is taking web surfing and multitasking to extremes. I get a lot of information from the Internet, but I don’t consider it a replacement for in-depth magazine/journal articles and books, and I still enjoy delving into a weighty tome for an hour at a time. Or several hours, if my newly arrived copy of Breaking Dawn has anything to do about it. People get information from a variety of media presented at different density levels, and that seems to me like a pretty healthy state of affairs. Sometimes we just want an overview, and sometimes we actually want to learn enough about a topic that we can carry on a conversation with others about it. How deep we want to go just depends on where our individual interests lie. Admittedly, magazines nowadays (MIT Tech Review being one guilty party) are trying to appeal to the stereotype of a skim-happy public by encapsulating their articles in blurbs at the front of the magazine. Reading these predigested morsels in print, however, strikes me as a waste of time. After all, if I wanted shallow summaries, I could always go to the web site. (Well, actually, I’d check my RSS feed, but that’s beside the point.) If I have gone to the trouble of procuring a physical magazine, with pages I can stare at without getting computer monitor glow fatigue, that conforms to the shape of my grip and doesn’t mind getting rained on or stuffed into a bag alongside sharp metal objects like keys, I’m going to read whole articles. But maybe that’s just me.